Chopped cooked chicken, ricotta, marinara sauce, fresh basil and cooked spaghetti squash is mixed and placed back into the spaghetti squash shell, topped with Cabot Alpine Cheddar and baked until the cheese is melted. PREHEAT oven to 400°F. Place squash cut-side down in a large glass baking dish. Add enough water to come up the sides of the squash about ½ inch. 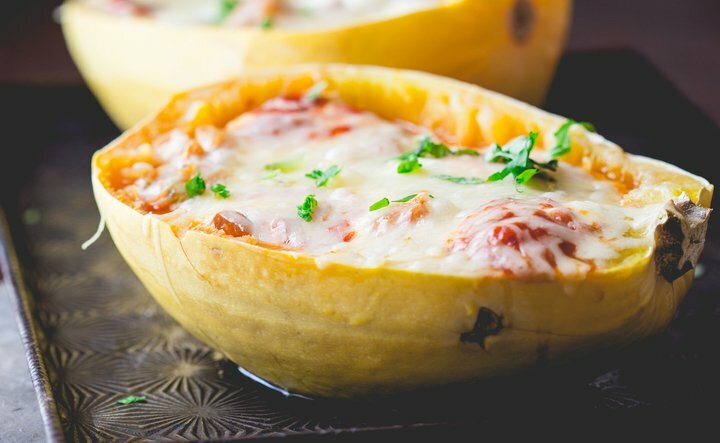 BAKE spaghetti squash until the flesh is tender and shreds into long strands when scraped with a fork, 45 to 50 minutes. Preserving the shells, scoop the cooked squash out into a large bowl. MIX the cooked squash with chicken, 1 cup marinara, 3 tablespoons basil and salt until combined. Return to the squash shells, dividing evenly. Dollop ricotta over the squash mixture, dividing evenly. Add the remaining 2 tablespoons marinara on top. POUR any water out of the baking dish. Set the filled squash in the baking dish. 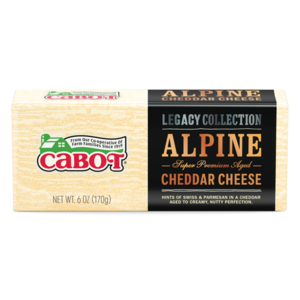 Top with Cabot Alpine Cheddar Cheese and bake until the cheese is melted and bubbling and the filling is steaming hot, 8 to 10 minutes.